Hon. Alden McLaughlin, M.B.E., J.P., M.L.A. 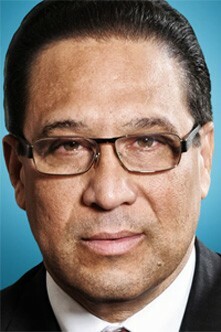 is currently premier of the Cayman Islands and Minister of Home and Community Affairs. Born and raised in George Town, Grand Cayman, he attended Cayman Prep and what was then the Cayman Islands High School. Following employment as a civil servant, he joined the law firm of Charles Adams and Co (now Charles Adams, Ritchie and Duckworth) as an articled clerk. Following his call to the bar in 1988, he was appointed an associate attorney with the firm. He was made a partner in 1993 and remained so until his retirement from the firm in 2005. He has served as a member of many professional and civic associations and committees too numerous to list. Notably, he was a long-standing member of the Grand Court Rules Committee and has served as President of the Caymanian Bar Association and President of the Lions Club of Grand Cayman. Alden was first elected to the Legislative Assembly in 2000 and is a founding member of the People’s Progressive Movement. He served as General Secretary of The Progressives (PPM) from 2002-2006. He served as the Minister of Education, Training Employment, Youth, Sports and Culture following success of his party at the polls in 2005. Following his party’s loss in the 2009 elections, he became the Leader of the People’s Progressive Movement and has led the rebuilding of the party and the development of The Progressives team which will contest the 2013 General Elections. As Minister of Education he led the transformation of education in Cayman, laying down the foundation for world class 21st century learning. This included a reform of the administration of education, the first ever national curriculum, a different approach to teaching and learning and special attention to early childhood education and special education needs. He was responsible for the passage of the Education Modernisation Law in early 2009. This new law raised the mandatory age for school attendance from 16 to 17 and set in place the framework for what is now being called the Year 12 programme in the government high-school system. He spearheaded the construction of 21st century learning environments with the new Clifton Hunter and John Gray campuses, an initiative for which he has and continues to receive both praise and condemnation. Despite the criticism of his detractors, he remains as passionate as ever about the need to improve education in the Cayman Islands and to produce young people who are creative and innovative, problem solvers and critical thinkers and who possess skills and abilities which are locally relevant and globally competitive. A lover of sports himself and understanding its critical importance to the health, well-being and development of the nation, as Minister of Sports, Alden led the rebuilding and improvement of every government owned sports facility in Cayman following the devastation of Hurricane Ivan in 2004. From as early as 2001, Alden was at the forefront of the constitutional modernisation process for Cayman and during his term as minister he led the national discussions regarding constitutional change as well as the negotiations with the UK Government. The result was a new constitution which was approved in the country’s first referendum in May 2009. For his contribution to constitutional development in Cayman, Her Majesty Queen Elizabeth II awarded him the M.B.E. in the Queen’s Birthday Honours in 2010. Alden has represented the Cayman Islands Government at the highest level internationally at forums and conferences and as member of delegations to London, Washington, D.C., Brussels, Melbourne, Australia, Cape Town, South Africa and a range of other jurisdictions. He is a great proponent of good governance and of the need for open, honest and accountable government. He has been an advocate for more democratic government, freedom of information legislation and for a Bill of Rights for the Cayman Islands. An avid cyclist, Alden makes time on his bike and in the gym a regular part of his daily routine. He loves reading, confessing to keeping two or three books going at the same time. He enjoys farming as well and he and his father have a small farm in East End. Alden and his wife Kim have two sons, Daegan, 20, at university in the UK, and Caelan, 17, at high school in Grand Cayman.